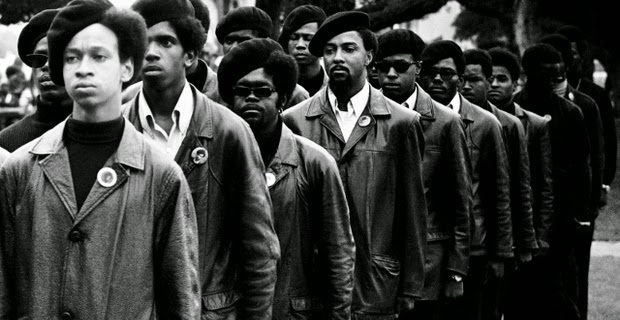 The celebrated documentarian Stanley Nelson has, in THE BLACK PANTHERS: VANGUARD OF THE REVOLUTION, created what must surely be the definitive history of the Black Panthers in America. That is not to say that there aren’t other complementary and more focussed documentaries out there. I have profoundly enjoyed films like THE BLACK POWER MIXTAPE, FREE ANGELA DAVIS AND ALL POLITICAL PRISONERS, as well as CHICAGO 8. But with the latter two in particular, we are focusing in on particular episodes. I can’t think of another documentary that has the editorial mastery to really try to contain the sweep of the movement. The film starts in Oakland in the late 1960s when Huey Newton and Bobby Seale read up on the law and realise that they have the right to bear arms so long as they are carried in public, and form a kind of self-defense league that is by its very nature far more than a defense but a provocation. The iconic fashions, bold rhetoric and threat of violence proves an attractive mix for everyone from Hollywood backers to young African-Americans who join chapters faster than the leadership can induct them. And so you get a movement propelled by its own youthful energy and momentum, part of a wider counter-cultural moment in American history. We see the movement reach its apex in the early 1970s, with social welfare programmes, and victories in high profile court case. But the seeds of its downfall are already sown. First of all, few organisations could withstand the determined onslaught of J Edgar Hoover’s CoIntelPro programme of dirty tricks, subversion and infiltration. Second, Hoover may have fanned the flames but the seeds of division were already present. Once Huey Newton was out of prison he was an iconic leader fighting for the right to control the movement against the exiled but charismatic and credible writer Eldridge Cleaver, let alone poor Bobby Seale. The documentary clearly shows Cleaver to be able to direct the movement toward militancy from the comfort of Algeria, never mind the consequences. And while Newton initially appears as the voice of reason, urging the Panthers to continue with their social welfare programmes, so reconnecting them to the ordinary people they claimed to represent, he too goes off the rails in a cloud of corruption, violence and drugs. All of which leaves Bobby Seale, the only leader still living, and the only one who genuinely tried to work within the system rather than dreaming of overthrowing it. He may not have won his mayoral race in Oakland but I’m sure I’m not the only one who saw in his voter-registration drive the very kind of tactics used by Obama to win the Presidency. There’s lots more to the story of the Panthers - their influence on movements in other countries both then and now, their influence on the New Panthers, and their relationship to other activist movements. But this is already a two hour documentary and admirably packed with content. I think Stanley Nelson really has encompassed as much as one possibly could while keeping an easy to follow through line and not sacrificing momentum or comprehensibility for an audience unfamiliar with the events portrayed. And along the way, he has unearthed some fantastic new archive footage, with partly compensates for his inability to get Bobby Seale, still an activist in the Bay Area, to participate. THE BLACK PANTHERS: VANGUARD OF THE REVOLUTION has a running time of 116 minutes. The movie played Sundance and Sheffield 2015. It will be released in New York on September 2nd.